I have long wanted to invest in direct stocks without the fear of the downside. For me, the EXIT has been the most important part of any trade. The ENTRY can be perfectly timed only rarely, but mostly when one talks about momentum based investing one can have the option to climb the momentum train at any station but have to mandatorily EXIT before it derails!! 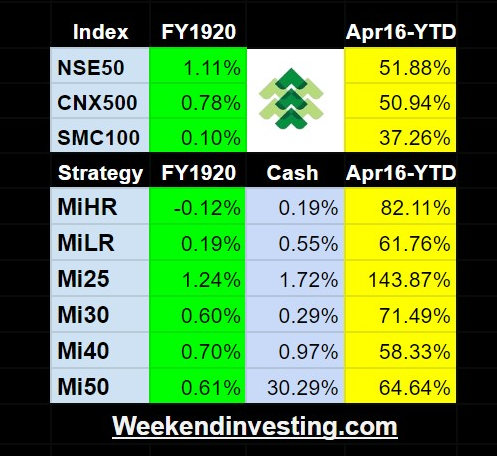 mi50 – the strategy, invests in NSE listed stocks which are filtered based on momentum and volume related criterion and Entry and Exits are purely price driven. The exposure to each scrip is limited to 2% and hence can hold a maximum of 50 stocks at any time. I expect only 40-50% trades to result in profits, however the profits on those profitable trades should outweigh the loss on the losing trades by a wide margin. Lets hope the journey is fruitful. What is the strategy behind entry and exits? Is there any marketcap criteria? Hello Vinith. The strategy remains proprietary for now. The basic tenets are momentum indicators, position sizing and liquidity filtering.